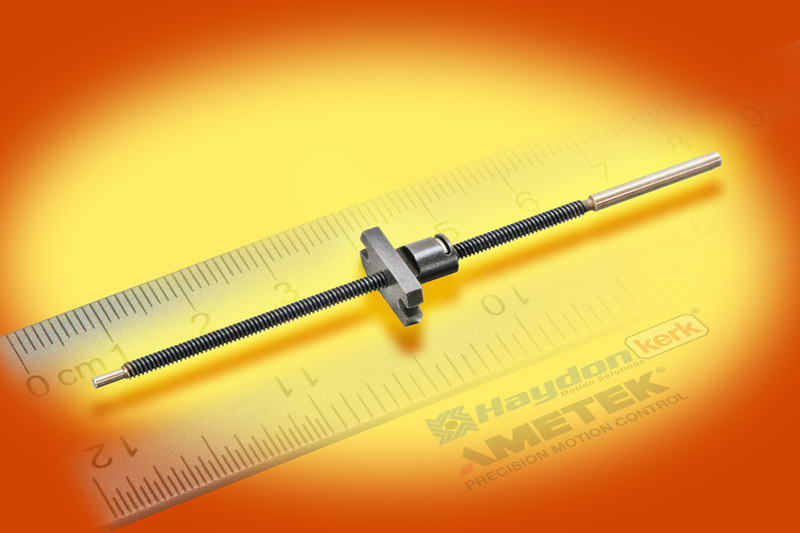 December 07, 2015 - "Press Releases"
Haydon Kerk Motion Solutions, a recognized leader in linear and rotary motion solutions, has added the world’s smallest anti-backlash lead screw assembly design to its line of Micro Series screws (2-mm diameter screws). Its ZBM nut technology can be customized to specific applications that require unique geometry and custom materials, such as Kerkite composite polymers. More after the jump. Haydon Kerk also has in-house molding and mold-making departments to help develop custom solutions for its customers. This new Micro Series anti-backlash nut with optional TFE-coated screw is now available 24/7 at the Haydon Kerk Express Store. Haydon Kerk has over 35 years of experience in the design of anti-backlash technologies and precision lead screws. Its new Micro Series ZBM nuts utilize a special nut thread system that, when combined with a radial force, provides simple backlash compensation. Initially designed for the optics-focusing market, the ZBM nut performs well in applications in which precise, smooth motion is required and space is at a premium. The new nut falls within the current dimensional envelope of standard freewheeling nuts, making a transition to an anti-backlash system easier. The design also is optimized for high-quantity production, allowing for best-practice, high-production efficiencies along with rock-solid performance. Utilizing Kerkite® engineered polymers or customer-specified materials (including PEEK), Haydon Kerk can design and manufacture a lead screw nut that delivers smooth, efficient rotary-to-linear motion conversion. In addition, with the use of a Kerkote® TFE coating, Haydon Kerk can effectively reduce the amount of torque required to produce the same amount of force. That, in turn, can lead to a longer assembly life as well as a possible reduction in motor size.